Dearest Eve, thank you for your article. 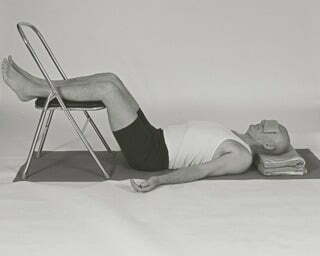 As you know, I have used restorative yoga and yoga nidra to support my recovery from illness. It has helped in so many ways – supporting my immune system, helping with pain management & reduction (fibromyalgia), reducing fear/anxiety, and keeping me smiling through some very difficult times. When you can’t do anything else you can always lie down, and find solace in your own breath and learn that you have the capacity to change your state of mind and body in subtle but cumulatively powerful ways. When in difficult times, these practices are such a gift. Supta Badda Konasana Bound-angle pose Equipment: blanket, belt and one or two bolsters. 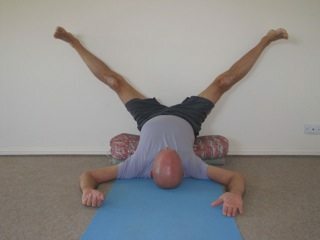 Supta Padangusthasana Leg Stretches – Equipment: Belt and Blanket.